When Haley Moss, an attorney, visual pop artist, and author from Florida, was 13, she went to the Autism Society of America Conference, a conference dedicated to presentations, discussions, and workshops about autism. It was the first time she’d ever been in a space designed for autistic people. “At such a young age, it was incredibly powerful to meet other autistic people, especially college students and adults,” Haley says. She believes autistic spaces are wonderful opportunities for autistic people to learn more about themselves and discover the diversity of autistic people. “For many autistic people—especially younger autistic folks—it is the first point of contact we have with others like us,” she explains. In a world that is overwhelmingly not designed for autistic and disabled people, there is power in spaces and communities created specifically for us. The Autistic Self-Advocacy Network (ASAN) is a nonprofit run by and for autistic people. ASAN develops autistic cultural activities. Autistic spaces and communities give autistic people settings where we can be completely ourselves, according to Noor, and that offers an unparalleled freedom. Many autistic people feel the need to mask or appear as non-autistic as possible when we’re among non-autistic people—and that can be exhausting. When I’ve spent a couple of hours dedicating most of my energy to hiding my autistic traits, it usually leads to equal or greater time spent burn out. So if I have to mask for eight hours, for example, I’m frazzled and unable to properly function for another eight to 16 hours. Laura K. Anderson, a doctorate student at the University of Northern Colorado studying special education, agrees that masking takes a huge energy toll on them. That’s one reason they started a private Facebook group for autistic women and nonbinary people. They’ve also found that being part of autistic communities on- and offline is a great tool for self-knowledge. In a space where everyone is autistic, you can get feedback on aspects of your life (“Does anyone else experience this?” or “How would you handle this situation?”) and receive tips from other people who understand your experience. “I can learn about myself, both by asking questions about my experiences and by reading their questions and thinking about my own life,” says Laura. “My depth of knowledge about myself has increased significantly, and I’ve learned that I’m not alone.” I’m also a part of a private group for autistic people online and I’ve used it to ask if anyone else experiences the world in the same way—do other people feel similarly overwhelmed by dropping someone off at the airport or do they get up in the middle of a workday to dance for five minutes? There’s a deep sense of joy in being part of a community that understands and respects you exactly the way you are. Laura loves the beauty of being in a room full of people who are stimming, or performing repetitive motions for sensory reasons. “It is a beautiful feeling, to see everyone else moving their bodies in natural ways and then letting your own body move the way it wants to,” the say. Sarah Pripas-Kapit, a writer and chairperson of the Association for Autistic Community, experiences this joy through the unique traditions that are created when autistic people come together. The Association for Autistic Community runs Autspace, a retreat that is organized by and for autistic people. One of these developing traditions is a glow party, where people at the retreat go into a dark room and play with glow toys for a few hours. “It’s a ton of fun and is a real celebration of autistic differences,” says Sarah. At Autspace 2018, they also had pattern blocks that were out in the main area for people to play with whenever they wanted to. Designing accessible retreats is important to Sarah and the Association for Autistic Community, but that isn’t without challenges. Autistic people have a variety of access needs and accommodating those needs at the same time can be difficult. At their conferences, it’s totally okay to walk out in the middle of a presentation, sit on the floor, play with pattern blocks, or flap your hands. They also make it a priority to host the retreat in a space that does not have fluorescent lights in the main areas, and they have a quiet space available for those who need it. It’s also important to have autistic spaces and communities that are dedicated to people who have intersecting identities, like the Black Disability Collective, a movement and closed Facebook group for black disabled people founded by Teighlor McGee, a black autistic poet and advocate. Autistic people of color need their own spaces free from white supremacy and racism, and white autistic people need to prioritize access for autistic people of color. It can be powerful to be part of a community space that’s designed at the intersection of your identities, like a group specifically for autistic Jewish people or for autistic LGBTQ+ people. While I’m not a part of any formal LGBTQ+ autistic groups, I love spending time with my friends who are part of both communities because there’s a deep sense of mutual understanding. 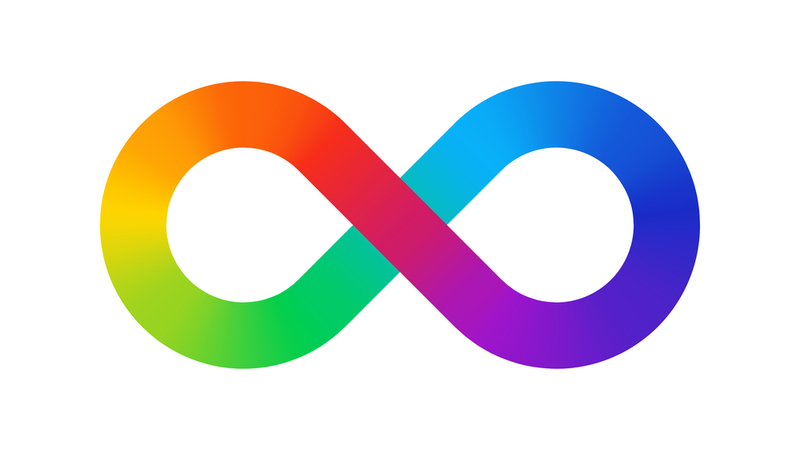 Autistic communities like the Autistic Self-Advocacy Network, social media groups, and Autspace also encourage something that’s sorely missing from mainstream spaces—autistic pride. In 2011, autistic people reclaimed April as Autism Acceptance Month (some are also now referring to it as Autistic Pride Month), and it has become one of ASAN’s major projects. I find this blog post very interesting from a couple perspectives. First, that intentional, autism-specific conferences, social groups, Facebook groups, autism-specific communities, retreats, spaces, cultural activities, etc. are not only in existence and created by groups like ASAN, but celebrated and desired. I’m a huge fan that these opportunities exist and thrive. However, second, I find this enthusiasm interesting because it is ASAN and their cohort at HSBS Advocacy Coalition who strive so vehemently to prevent autistics from living together in intentional communities designed to provide them housing designed around their needs using HCBS waiver funding. Person-centered should mean the choice of the person and the funding should follow them wherever their person-centered choices take them. The opposition arises when it is not the person themselves but their family or guardians whose choices dictate where they (and their funding) are taken.